A Cormorant in typical pose on the north Wirral coast © Steve Round www.stevenround-birdphotography.com/. At dawn on Jan 20th 2015 3,884 Cormorants flew out of the Dee estuary past Hilbre Island. This is 11.1% of the over-wintering population for the whole of this country, a remarkable number and undoubtedly the highest ever single count in the UK for this species. "I was interested to read HiBO’s reports of large numbers of Cormorants leaving the estuary at dawn, this ties in with recent counts I have carried out from Parkgate and the discovery of the night time roost site on the edge of the saltmarsh at Burton (Dee Estuary RSPB Reserve). Over the last couple of years whilst carrying out the Hen Harrier roost survey at Parkgate I have observed flocks of Cormorants flying up stream at dusk, about 2 km out following the edge of the outer saltmarsh and often wondered where they were roosting. Day time high tide WeBS counts have shown that Cormorants are increasing in the North West and internationally important numbers occur on the estuary. On 16th December 2014, Dan Trotman and I were carrying out the WeBS low water count off Burton Marsh when we came across a large area of white washed pioneer saltmarsh which smelt very strongly of what I can only describe as a fish market on a hot day! Tell tale signs of black feathers suggested that this is the site of a massive Cormorant roost. One late afternoon I located a vantage point along Well Lane, Ness and I was able to see a huge black mass of Cormorants in the fading light at the roost location. Since then I have carried out counts from Parkgate, birds noted to fly upstream about two hours before dusk, counts as follows: 1,100 on 29th Dec, 1,400 on 2nd Jan, 1,700 on 10th Jan and 2,000 on 18th Jan. It is possible that a lot of birds are missed due to the distance involved and poor light conditions, I have noted that birds are still coming in when it is virtually dark. These circumstances could account for the discrepancy between my counts & HiBO’s. As far as I’m aware the Hilbre count of 3,884 is an all time record for the UK, the previous record being from the Ribble. One would presume that these birds are the same as the one’s I’ve counted from Parkgate and are roosting at Burton. From my research, it appears that the Dee Estuary has one of the largest night time roosts of cormorants in the UK. The big question is "where are they feeding and how far are they travelling to the roost from within Liverpool Bay?” So hopefully I have answered your question where they are roosting!" Colin Wells. Figure 1 - Max annual counts at Hilbre 1969 to 2015, data provided by Hilbre Bird Observatory. Just how steeply numbers have increased at Hilbre is shown by Figure 1. After very low numbers in the 1980s, for example 1987 max was just 33 (in June), there was a step change upwards in the 1990s followed by a steep increase from 2000 onwards. Figure 2 shows the Dee estuary WeBS (Wetland Bird Survey) counts also increasing significantly and there was a record WeBS count for the estuary of 1,633 on Nov 18th 2013. Figure 2 - Max Annual counts Dee Estuary Wetland Bird Survey - 1987 to 2013. There have been similar increases in the nearby Ribble estuary, with a max of 543 in 2005 increasing to 3,297 by December 2012 and a 2013 max of 2,586 in December. All this means is that Liverpool Bay is currently the most important over-wintering area in the UK for this species. The Great Cormorant Phalacrocorax carbo (to use it's full and scientific names) increased substantially across the whole of Western Europe in the latter part of the 20th century, fuelled at least partly by reduced persecution thanks to the EU's Bird Directive enacted in 1979. However, in the 21st century numbers have levelled off or even decreased. In the UK the Index for breeding birds increased from a baseline of 100 in 1986 to a peak of 150 in 1995 after which there has been an overall decline down to 90 in 2013. WeBS winter counts for the whole of the UK increased from an index of 56 in 1987/88 to a max of 117 in 2003/04 then down to 100 in 2012/13. This is in marked contrast to the sharp increase in the Dee and Ribble Estuaries over the past 10 years. The map shows a good proportion of the ringed birds recorded over the past 15 years or so in Cheshire, Wirral and Seaforth Nature Reserve. Seaforth, just across the River Mersey from New Brighton, is much used by Cormorants for roosting, particularly during storms, and is a very good site for spotting colour rings. The large majority of Cormorants are ringed as chicks on the nest so the map tells us where our over-wintering birds breed. As you might expect most breed along the coasts of the Irish Sea and nearby adjacent areas such as the Severn Estuary and Loch Fyne, and that comes to 78% of the total. But it's the other 22% which is intriguing. Birds breeding in the Netherlands and Denmark are all of the sinensis race, whereas it is generally thought all the birds in the Irish Sea are of the coastal breeding carbo race - but our map indicates that that may not be wholly true with sinensis flying across the North Sea and over the UK. In the UK the majority of inland breeding birds are also sinensis so again it's interesting that five birds from Abberton Reservoir and two from Grafham/Rutland Water have also ended up in Liverpool Bay, but here things aren't quite as clear as not only do some carbo breed inland there is also evidence for hybridisation between the races - nevertheless a north-west movement is unexpected. One of the birds ringed at Grafham Water was satellite tagged and was tracked not only to Seaforth but also off north Wirral and in the Dee estuary itself. Whatever the race of these birds the fact they are flying such a long distance to Liverpool Bay shows it's importance as a winter feeding area. Both the Hilbre and Dee Estuary WeBS monthly counts show it is only over the past eight years that large numbers have appeared mid-winter, whereas previously the peak has always been in September - Hilbre data is shown in Figs 3 and 4. Figure 3 - Hilbre monthly max - average 2010 to 2013, data provided by Hilbre Bird Observatory. Figure 4 - Hilbre monthly max, 1994 to 1996 and 2004 to 2007, data provided by Hilbre Bird Observatory. So it seems that during the rapid rise in numbers in Liverpool Bay over the past few years there has been a particularly dramatic increase in over-wintering birds and as this has occurred during a time when national numbers have been decreasing they must have re-located from elsewhere. The ringing returns indicate that it is certainly possible that some of these Cormorants are sinensis, may be from both the continent and inland in the UK. Of note is that Cormorants only started breeding successfully in Cheshire in 2004 since when numbers have increased significantly so that in 2013 there were at least 184 pairs, equating to 736 birds if we assume two young successfully fledged - a very significant increase from zero in 2003! We don't really know what race these birds are but expert opinion is that they are mostly sinensis. So do these local nesting birds disperse inland in winter or are do they fly just a short distant to the Dee Estuary and Liverpool Bay? We don't know but it does seem a hell of a coincidence to have two adjacent populations increasing rapidly at the same time. Another source for our birds could be due to the relocation of carbo birds from within the Irish Sea and adjacent areas and, looking at WeBS data, it is noticeable that there has been a sharp fall in numbers in Northern Ireland since 2005, from around 2,684 in 2005/06 to to 1,535 in 20012/13, if they have all moved to Liverpool Bay than these would account for a good proportion of the increase. So far in this article I have refrained from using the four letter 'F' word - that is to say Fish! Because Cormorants eat fish they have come into conflict with man over many centuries, but particularly during the 19th century and the first half of the 20th. European legislation in the 20th century resulted in a big increase in numbers as previously stated, but this has now brought them into further conflict with the fishery industry and culling is now once again taking place, albeit in a controlled manner. Whether this culling is really necessary is disputed. On the subject of culling and persecution I finish with some quotes and if anybody has any problems with what they say please take it up with the authors, and not me! David Norman (Ref 13): The Cormorants' move to breeding and wintering inland in the UK is an apt metaphor for man's abuse of the environment. Man has ovefished the seas and overstocked some inland waters; it is not surprising that this adaptable seabird has responded. S. Van Rijn (Ref 14): No significant conflicts with commercial fisheries occur at present in the Netherlands. Most commercial fisheries are aware that Great Cormorants are not the main problem concerning the general decline of the commercial fish catch. The fact that the Netherlands have no active management or regulation of breeding numbers is unique in Europe. This shows that communication about the ecological position of Great Cormorants and other fish-eating birds can result in a better understanding of a changing world. Linda Wires (Ref 15): .....I have visited many cormorant colonies, and come to realise that this bird is one of the most remarkable creatures I have ever encountered. .....the extent to which cormorants actualy harm human interests is unclear. Some prey species are commercially valuable but the bulk of the cormorant's diet consists of species not valued by humans. And despite it's reputation for devouring fish, its daily food consumption relative to body mass is no greater than that for other fish-eating birds. To date no study has demonstrated that cormorants pose a threat to the survival of healthy fish populations in natural systems. Ultimately, the cormorant's story reflects a culture still deeply prejudiced against creatures that exist outside the boundaries of human understanding and acceptance. To determine wildlife policy for these and other such creatures in the absence of scientific evidence is deeply flawed. 1. Hilbre Bird Observatory database, with thanks to Steve Williams. See Hilbre Bird Observatory Blog. 2. Colin Wells, RSPB Dee Estuary Manager. 3. Colin Wells and Neil Friswell, Dee Estuary and North Wirral Forseshore WeBS Annual Report 2012/13. 4. BTO WeBS Report: Waterbirds in the UK 2012/13 (and online historical data). 5. Cheshire and Wirral Bird Reports - 1987 to 2013, CAWOS. 6. Lancashire Bird Reports - 1995 to 2013. 7. Bird Atlas 2007-11, BTO. 8. BTO Migration Atlas, 2002. 9. Birds of the Western Palearctic, BWPi - Interactive version (2003 - 2006). 10. Andrew Musgrove et al., Overwinter population estimates of British waterbirds, British Birds 104 July 2011, 364-397. 11. S. E. Newson et al., The Status of inland-breeding Great Cormorants in England, British Birds 100:5, 289-299, 2007. 12. 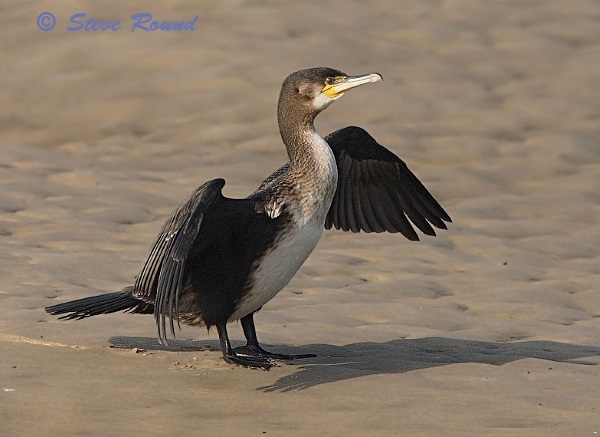 JNCC Great Cormorant Status, Breeding Abundance - http://jncc.defra.gov.uk/page-2876. 13. D. Norman, Birds in Cheshire and Wirral (2004 to 2007 Atlas), CAWOS. 14. van Rijn, S. 2014: Status of the breeding population of Great Cormorants in The Netherlands in 2012. – In: Bregnballe, T., Lynch, J., Parz-Gollner, R.,Marion, L., Volponi, S., Paquet, J.-Y., Carss, D.N. & van Eerden, M.R. (eds. ):Breeding numbers of Great Cormorants Phalacrocorax carbo in the Western Palearctic, 2012-2013. – IUCN-Wetlands International Cormorant Research Group Report. Scientific report from DCE – Danish Centre for Environment and Energy, Aarhus University. No. 99: 146-150. 15. Linda Wires, Angels of Death, New Scientist 7 February 2015. Starting top left and clockwise: 1. Brent Goose HDRB (Matt Thomas) 2. Brent Goose HSWB (Steve Williams) 3. Knot - W1?greyYY (Richard Smith) 4. Black-headed Gull EK57175 (Elliot Monteith). 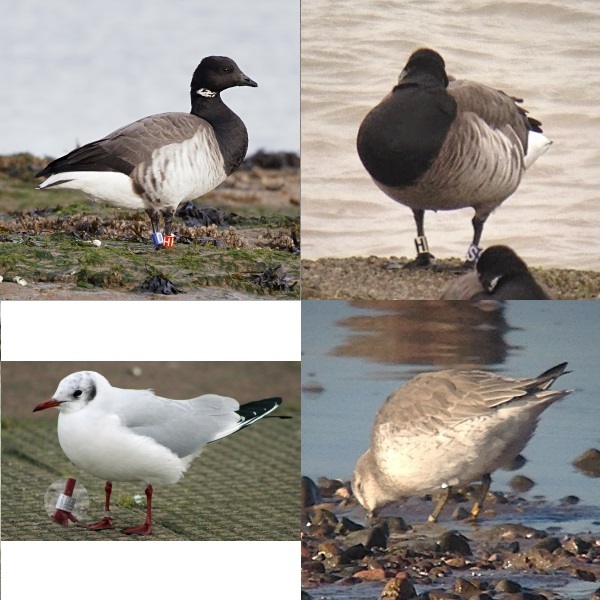 Colour-ringed Brent Geese have been recorded by the Hilbre Bird Observatory for a number of years. Up to now these have all been of the light-bellied race which breed in Canada with most spending the winter in Ireland. There is another population of light-bellied brents which breeds in Svalbard and spend the winter in Denmark and Lindisfarne, Northumberland (known as the East Atlantic population). 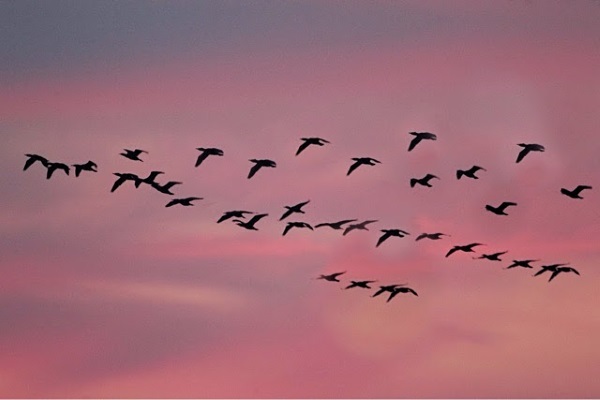 Interestingly, this is the smallest discrete population of migrating geese in the world with an estimate of just 7,600 individuals in 2009. For the first time one of these Svalbard birds was identified at Hilbre this winter - see details below with two other Brents (see photos). YTGR (Y on green ring, T on red ring) - ringed at Limfjord Staging area, Denmark, on May 3rd 2011. Recorded on Hilbre on December 16th 2014 and January 14th 2015 (and various other dates this winter). HDRB (H on red ring, D on blue ring - see photo) - ringed on Axel Heiburg Island (Arctic Canada) on August 2nd 2007. Recorded on Hilbre in November, December 2014 and January 2015. First recorded on Hilbre on December 24th 2008 and recorded every winter since. HSWB (H on white ring, S on blue ring - see photo) - ringed in Dungarvan Harbour (Northern Ireland) on December 18th December 2008. First recorded on Hilbre on November 12th 2010 and recorded every winter since. Thanks to the Irish Brent Goose Research Group (www.irishbrentgoose.org) for information about these birds. Unfortunately, the Knot in the photograph above has a ring missing so we can't identify it individually, but the white flag on the left tibia identifies it as a Canadian ringed bird and the two yellow rings on the right tarsus means it was ringed sometime between July 9th 2001 and June 16th 2007 at Alert, Ellesmere Island, Nunavut, Canada - just 500 miles from the North Pole! This bird was recorded at Thurstaston on February 6th 2015. Metal Ring EK57175 - Ringed by Alan Hitchmough in New Brighton on December 30 th 2009. Recorded in New Brighton on January 17th 2015. Previous record: Talacre Beach (Point of Ayr) on August 17th 2014. Not a very exciting record but it does demonstrate how site faithful Black-headed Gulls are and also that, with today's cameras and telescopic lenses, it is not only colour rings that can be read without re-catching the bird. Colour-ringed birds were also recorded by Hilbre Bird Observatory, Elliot Monteith, Steve Hinde, John Jakeman and Alan Irving. 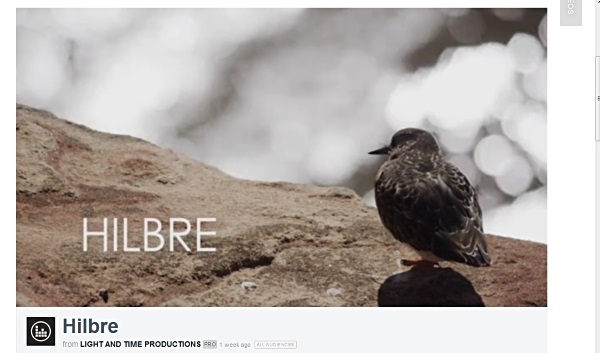 A very nice video of Hilbre Island has recently been produced - see it at https://vimeo.com/123480029. Scoters were very much in evidence with numbers of Common Scoters approaching those of last year with at least 20,000 counted on the 28th. But it was a Surf Scoter which caused great excitement, it was thought one was present in the vast flocks but it was just too distant from Hoylake prom to reliably identify so a trek out to the edge of East Hoyle Bank was undertaken and it was a rewarding trip! 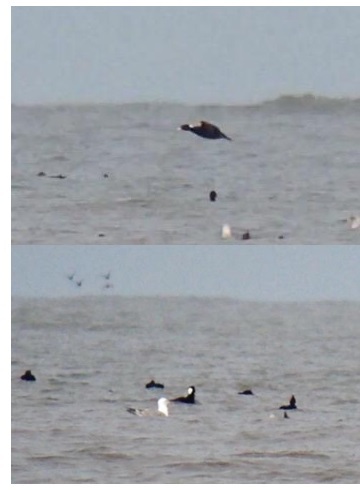 It was discovered on the 25th, and to quote the Lighthouse Blog "Cheshire and Wirral's long awaited first Surf Scoter was discovered early this morning among the many thousands of Common Scoter off Hoylake by lighthouse regulars Allan Conlin and Kenny Dummigan, a well deserved reward for many weeks of searching for this species here." Also recorded were up to six Velvet Scoters, three Eider and two Long-tailed Ducks. Two Eiders were off Heswall and Parkgate during the spring tides. Laughing Gull at New Brighton flanked by two Black-headed Gulls © Elliot Montieth. 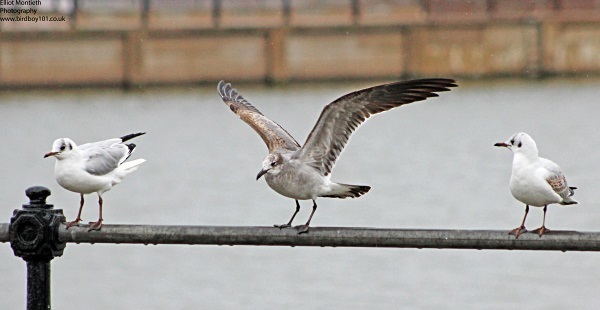 The Laughing Gull is still at New Brighton (see March Newsletter), a Glaucous Gull was at both Hoylake and Wallasey early in the month, a Caspian Gull was at Meols on the 28th and an Iceland Gull was seen on several occasions along north Wirral. 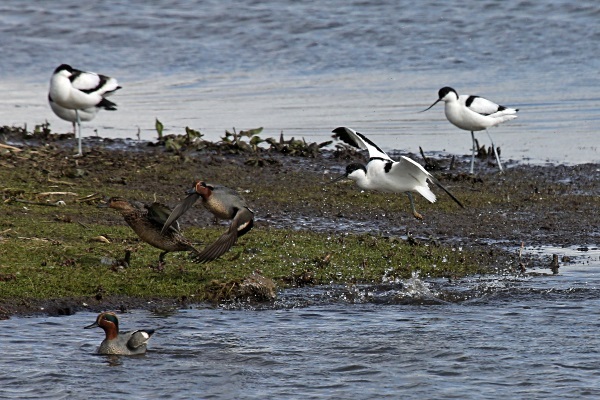 Avocet chasing Teal at Burton Mere Wetlands, March 28th © Roy Lowry. Avocet numbers built up to at least 40 at Burton Mere Wetlands, some of these will be on their way further north but hopefully quite a few will stay to breed. Also at BMW was the long-staying Long-eared Owl, two Great White Egrets and a couple of Cetti's Warblers. 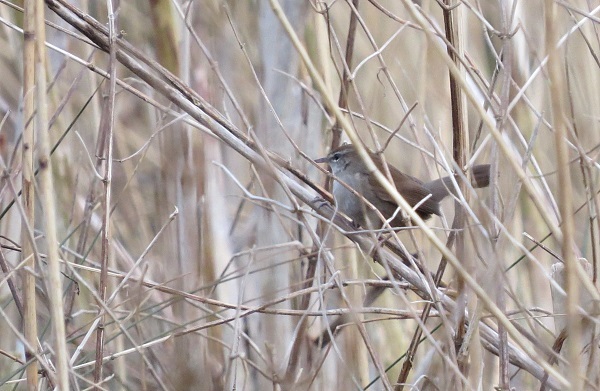 Numbers of Cetti's Warblers breeding around the Dee estuary must surely be now in double-figures - strictly speaking it is still a county rarity! The spring migration was slow in March, as it often is, but first dates of most migrants were typical for recent years. The first Sand Martin was early but we have had earlier dates. Although a passage of Stonechats probably occurs most years it usually involves just one or two birds but this year we have had a really good number of birds with the total of daily records coming to 61 - which includes a max of five at Parkgate, at least 10 on the Hoylake Langfields and 15 in the Leasowe Lighthouse/Leasowe Castle area. We expect to see our first Whitethroat, Cuckoo and Swift during April, or perhaps early May. Many thanks go to Glenn Moriss, Peter Nicol, Mike Davenport, Eddie Williams, Pam Green, Derek Bates, David Parker, Mal Sergeant, Ian Fleming, Matt Thomas, Richard Beckett, Chris Butterworth, David Peate, James Smith, Steve Hinde, Roy Lowry, Allan Conlin, Colin Schofield, David Haigh, Jeremy Bradshaw, Alan Hitchmough, Steve Williams, Charles Farnell, Mark Gibson, Elliot Montieth, Paul Mason, Dan Trotman, Greg Harker, Manu Santa-Cruz, Bernard Machin, Henry Cook, Andy Thomas, Janine Johnson, Paul Vautrinot, Sheila Ryde, David Leeming, Fred Heywood, Steve Hasell, Mike Buckley, Mike Hart, Ray Sherlock, David Huntingford, David Owen Jones, Denzil Nicklin, Jonathon Thornton, Ray Eades, Elizabeth Maddock, Mark Peers, Stephen Burke, Mike Naylor, Kevin Smith, Phil Langford, Tanny Robinson, Jack Longman, Dave Edwards, Tom Moulsdale, Nicky Brooks, Gail Wilson, Geoff Atherton, Robert Whiteside, Douglas Holmes, Marc Gannon, Mark Turner, Derek Cook, Keith Ackerely, Douglas Holmes, Peter Newman, Dave Wilson, Jeff Cohen, the Lighthouse and Wirral Birding Blog, the Dee Estuary Wardens and the Hilbre Bird Observatory for their sightings during March. All sightings are gratefully received. April is a very busy month with spring migrants pouring through our area - out to sea, through the estuary and over land. Given westerly winds we will get large numbers of Gannets offshore, maybe hundreds, together with Manx Shearwaters, skuas of various species and Little Gulls. The first Common and Little Terns of the year will appear and if the weather is calm look out for large numbers of Common Scoters as well as grebes and divers on the sea. In the estuary Whimbrels will be heading north on their way from West Africa to Iceland and northern Scandinavia. The last two years has seen a build up of over 1,000 Black-tailed Godwits in West Kirby - either at Gilroy or the Caldy Wildfowl Collection - pausing on their way to Iceland and looking glorious in full breeding plumage. Over the marshes we should see Marsh Harriers and we usually have several Ospreys with hopefully one or two pausing for a few hours for a spot of fishing. But perhaps it's the land birds which most birders look forward to, both the return of our breeding birds and those on passage which are only seen at this time of year. Last April was particularly good for Redstarts but each year is different. Species to look out for in particular are Ring Ouzels, Yellow Wagtails, White Wagtails, Whinchats, Grasshopper Warblers and both Common and Lesser Whitethroats. Some mornings we can go out and every bush seems to have a singing warbler, every fence post a Whinchat and every field covered in Wheatears and wagtails. April is a great month for rarities and last year alone we had Little Bunting, Night Heron, Velvet Scoter and Wryneck. 18th April, 11.30hrs (BST), 9.8m. 19th April, 12.16hrs (BST), 10.0m. 20th April, 13.00hrs (BST), 10.0m. 21st April, 13.44hrs (BST), 9.7m. Saturday 18th April and Sunday 3rd May (also two later dates in May), Weekend Walkabout at Burton Mere Wetlands. Join one of our friendly, knowledgeable volunteers for a gentle walk from the Reception Hide to the end of the Hillfort Trail on Burton Point, to learn more about the wildlife that thrives here, the work we do to give nature a home and the remarkable history of the estuary. Great for first time visitors or those who'd like a guide to help them get the most enjoyment from a visit. With constant changes as we move through the seasons, it's impossible to predict what might be seen but nesting wading birds, herons and ducks are guaranteed, with an array of colourful flowers, butterflies and dragonflies emerging into the warmer months, there's always something to marvel. Telephone 0151 353 8478 for further details. Saturday 25th April, 10 am-4 pm, Binocular and Telescope Demo Day at Burton Mere Wetlands. Are you interested in a new pair of binoculars, or want to try a telescope, but not sure what to look for or what the numbers mean? If so, don't miss this event, with helpful staff from RSPB Conwy here to give you expert advice on choosing the best binoculars, telescopes and accessories to suit your needs. There will be a wide range of choice, and stock available to buy and take away on the day. Card payment facilities will be available. The event will be held outside the Reception Hide, giving you a great opportunity to try products. It's free, but normal admission charges do apply for non-member visitors wanting to head around the reserve too. Whether you're choosing your first binoculars or looking to upgrade, we'll have the right optics for you. Sunday May 3rd - 4:30am - 6:30am, Dawn Chorus at Royden Park. 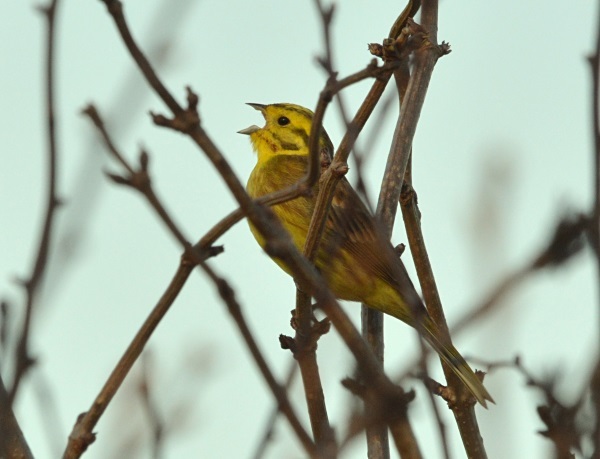 Listen to the fantastic sounds of nature as birds sing at this very early time of year. If you have them, bring a pair of binoculars. Meet at the Court Yard/Coach House at Royden Park.